Happy new year everyone! After a very hectic fall, I was able to take some quality time over the holidays to do absolutely nothing, and it was heavenly. I took a lot of naps, read a few books by roaring fires, and enjoyed quality time with family and friends. Exactly what the holidays should be. But as a result of doing a whole lot of nothing I didn’t have many of my usual adventures. So what do I do when I know I need to try something new and I don’t have much time to do it? 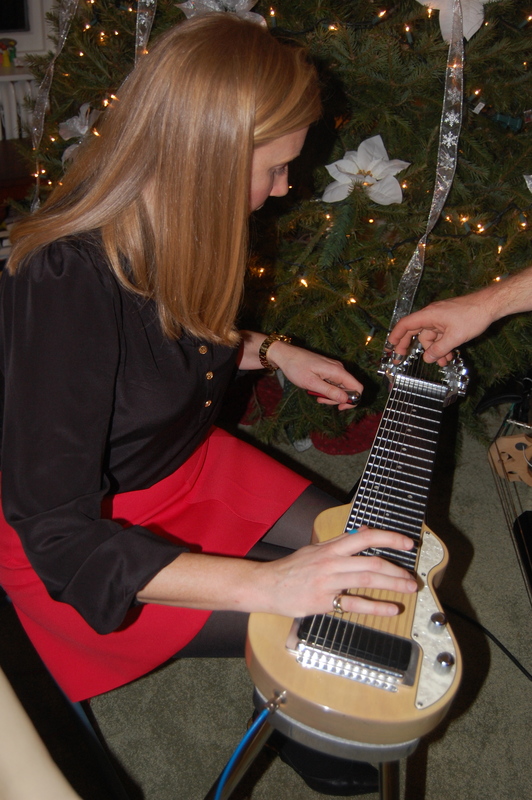 Well, I commandeer the band my parents hired to play at their holiday party and get an impromptu lesson on the steel guitar…of course. My mother throws eclectic parties. 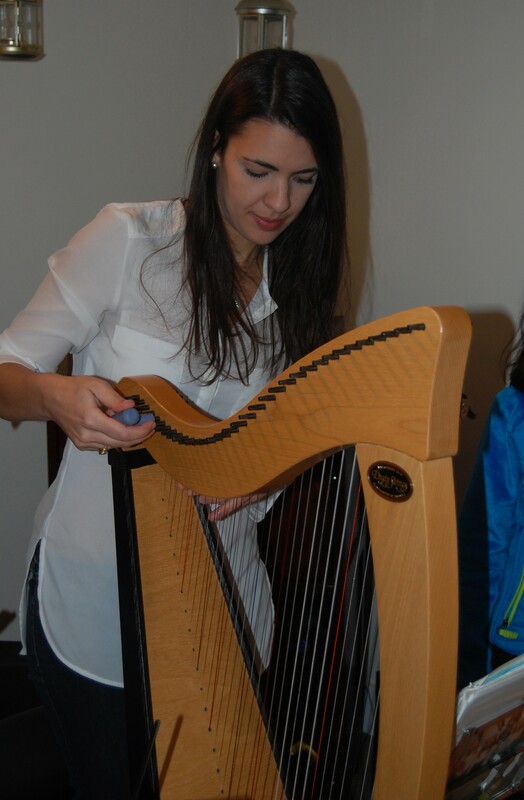 This year she hired Slowey and the Boats to play at our house for a family party a few days after Christmas. You certainly can’t call this three-piece band’s sound “traditional holiday,” it was more like “holiday on the Big Island.” And that distinct sound came courtesy of Isaac Stanford’s steel guitar. So of course, Isaac is who I had to sweet talk into giving me that impromptu music lesson at the end of their set. You would definitely recognize the sound of the steel guitar; it’s that elongated, almost whiny sound you hear in island music. 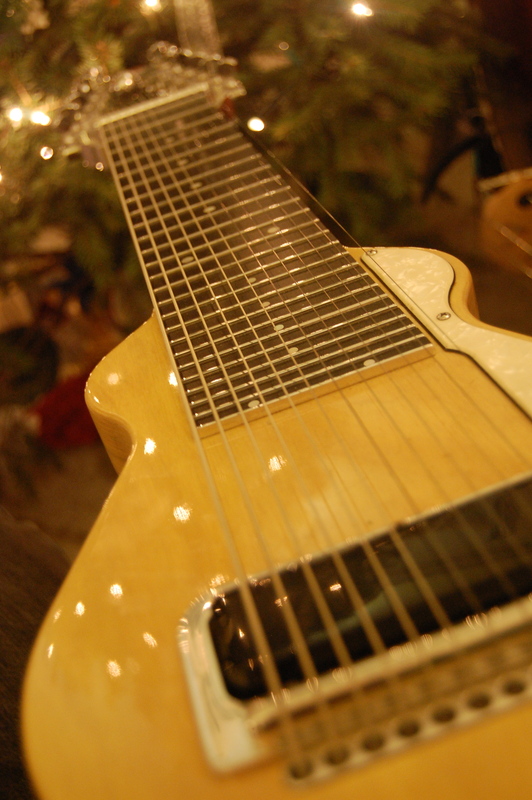 Unlike a traditional guitar, the steel guitar is played horizontally with the instrument sitting on a table-like stand. Also unlike a guitar, you play it with finger pics for the most part, not by plucking or strumming. Its origins are in Hawaii, but as Isaac told me, it began being incorporated into American country music in the 1920’s. 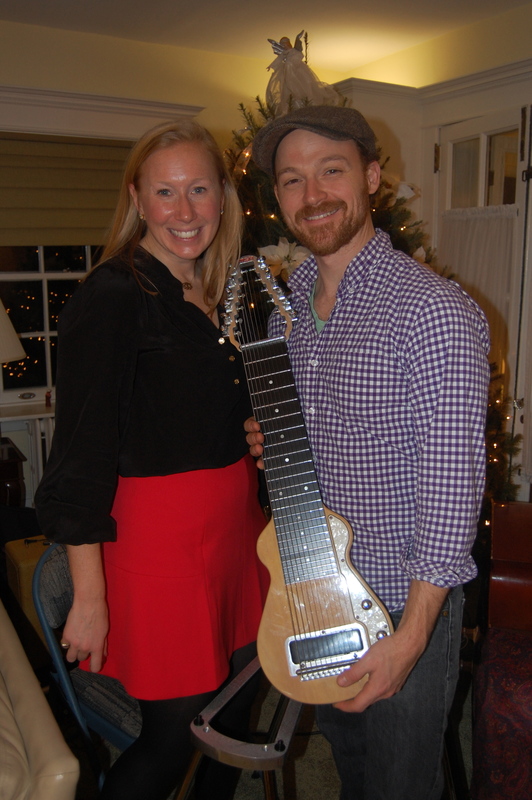 Typically a steel guitar has 6 or 8 strings, but Isaac’s has 12. And that provided more opportunities for me to bastardize its sound. First lesson I learned about the steel guitar: do not play while wearing a mini skirt. Thankfully I was among family. Second lesson of the steel guitar: do not play with a fresh manicure. Two life lessons right there. I quickly realized that the steel guitar, even on the most basic level, takes a lot more musical knowledge (like reading notes), and multi-tasking than the harp. The notes seemed more complicated, one hand has to pluck, as the other brushes a bar called a steel up and down the strings on the neck of the instrument. which changes the pitch, that creates its distinct sound. So after a few minutes of struggling, with about a dozen people looking on, Isaac and I decided that, for me, “conquering “the steel guitar would mean one, single chord…but a nice long clean chord. That involved picking one string with my right hand, while gently, evenly moving the steel down the neck of the guitar and gently lifting it off the strings so that the chord ends neatly. And you know what, it only took me two or three attempts to get the sound I was looking to achieve. And just as I finished, with a huge smile breaking out over my face, my audience broke into applause. Now true, they are my family, and they are biased, but it made me feel like a million bucks none the less. Me, Isaac and the steel guitar. Photo courtesy of Maureen Mahlman. This week’s post showed me that I can seek out new experiences, large and small, in a variety of spots…even in the corner of my parents’ living room wedged next to the Christmas tree. Happy new year everyone! I have a feeling 2014 is going to be a great one! I’d like to thank Issac Stanford and Slowey and the Boats for letting me squeeze a lesson into their gig. If you live in the Philadelphia area, and are looking for a three, or five-piece band with a distinct sound, they may be the band for you. You can also check out their Facebook page if you want to check out one of their gigs around the city. I was not compensated for this post in any way. A few weeks ago I admitted that I had not sung out loud in front of anyone since I was emotionally roughed-up by a 9th grade choir teacher. My friend and loyal reader Chrissy Lamont, brought up the possibility of a vocal adventure over a year ago, and if I am being honest, I didn’t follow up with her as aggressively as I have pursued other bloggy requests. But she didn’t let me off the hook. When she started assembling a fundraising cabaret night to benefit a very worthy cause (a loving couple fighting to retain custody of the adopted daughter whom they have loved and cared for every day of the last three years), I said I would do it! I would face my fears, and sing…out loud…in front of people…who actually paid to hear me (but mostly they paid to hear the accomplished singers who were also set to perform). And just as fast as I agreed to be a part of this special performance, panic set in. 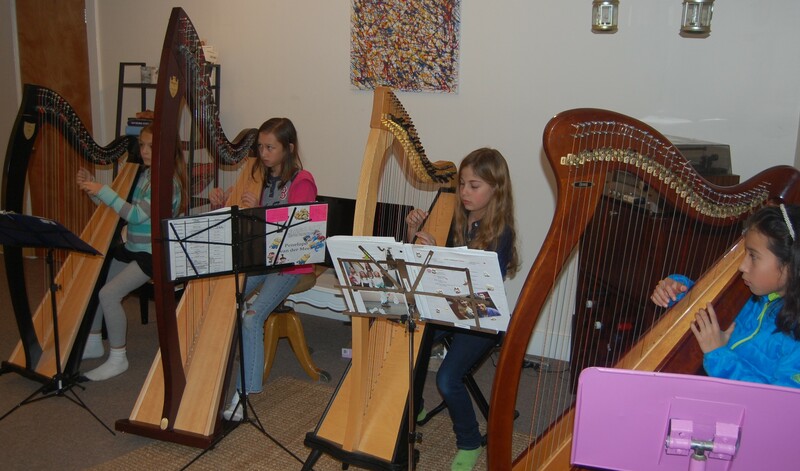 The concert was this past weekend at the Mansfield (Mass) Musical Arts Society. Since my introductory singing lesson with Christine Kasparian, I had practiced “Class”—the duet I would sing with Chrissy—a lot; singing along to the soundtrack of Chicago in the car, and in my apartment (I’m sure my neighbors think I am completely insane…and tone deaf). But I had tucked the reality that I would be singing in front of an audience waaaaaay in the back of my head. It did not seem like reality until I arrived at the theater. I really killed it during the sound check. I mean knocked it out of the park. I felt relaxed, I had all the lyrics down cold, and my voice sounded strong. But as we crept through the first act my nerves got the best of me. I suddenly had trouble remembering some of the words as I went through them in my mind, my hands were clammy, and my stomach was in knots. As the intermission came to an end the night’s master of ceremonies, the very talented and funny Rodney Raftery, opened the second act by introducing me and why I was there (obviously, an introduction was necessary in case I passed out on stage). During Rodney’s introduction a vocal child was politely escorted out of the theater while screaming, “No, no, no” at the top of his lungs. He must have known what was to come. So why beat around the bush any longer, here is what you all have been waiting for: my singing debut. So not to go all Type A on myself, but my actual performance wasn’t as good as my rendition during the sound check. I was physically stiff. I messed up some of the lyrics. I rushed it a little bit, meaning I started to sing a little early in a few spots, and then a little late in others. I must have blacked-out while performing, because my time on stage seemed to pass in the blink of an eye. I barely remember what happened. But you know what, I got through it. After the show ended, members of the audience approached me with complements that included “Bold,” “Not bad at all,” and “Brave.” Yes, in this case all these do count as complements. And I was buoyed by their support. Those positive feelings dissipated two days later when I finally brought myself to watch the video. I was mortified, and still am. Had I not promised to post it for all of you, I may not have. I sounded much better in my head. I’ve had pangs of regret over the potential embarrassment of having this video live on the Internet forever. But what have I been saying for the last year and a half on this blog? I am throwing myself into life’s possibilities trying to find what I’m passionate about. In the process, I’m not letting fear, my perfectionist tendencies, or potential embarrassment hold me back. And this singing-phobia had been holding me back for 15 years! So there it is. And here I am; slightly embarrassed after my most humbling adventure to date, but also proud of myself for getting up there. Many thanks to my dear friends Chrissy Lamont and Rodney Raftery, and all the fabulous performers of The Rose Concert. Your support helped me get through this without loosing my mind…or my voice. Even if we had idyllic childhoods, we can all likely point to a moment when we felt “scarred.” A moment that, at that time, felt so monumental and painful that we thought we may never recover. I had one of those moments…in 9th grade Concert Choir. I attended an all-girls school in Philadelphia, and freshman year some of our classes (starting off with music and art) were coed with the boys from the school across the street. So 9th grade Concert Choir was a BIG DEAL. Anyone could take Concert Choir, despite the fact that technically there was an “audition.” That was just a formality. So when the female teacher of this class who will go nameless (she had a male counterpart, and thank goodness for Mr Weir!) told me in front of the entire class, HALF OF WHICH WERE BOYS, that I should consider fulfilling my music requirement another way, I turned, not red, but purple in embarrassment. She went on to tell me that I should consider joining the hand bell choir. Again? Come on! I was a brace-faced freshman. Did I have a target on my back, or more accurately, a target on my vocal chords? With this preface, you can understand the reason that I have not sung out-loud in pubic since the late 1990’s. And I’m serious. While I take true pleasure in singing loudly and boldly alone in the car, I usually lips sync at church and even my go-to karaoke songs are not actually selections that require singing. I rap (Tupac and Wyclef being my favorites). But my personal singing drought stops now! 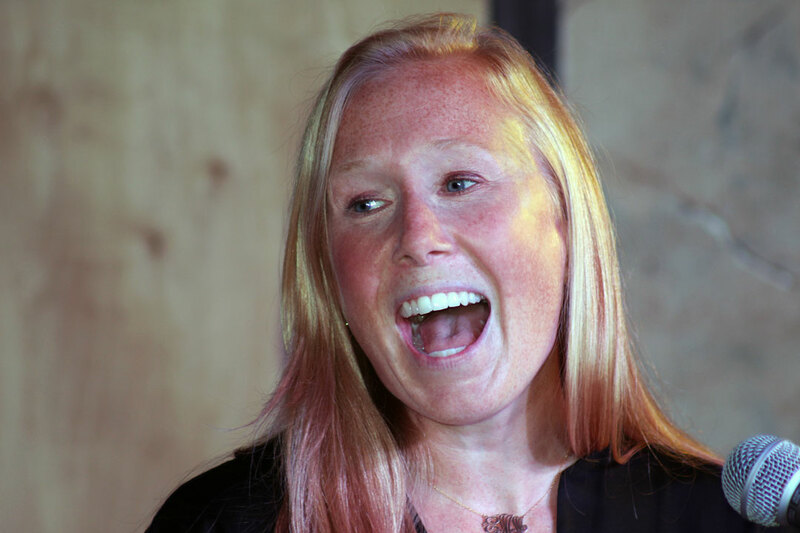 In the spirit of this blog, of putting myself out there, and not being afraid of failure, I will be singing at a cabaret night/fundraiser at the Mansfield (Mass) Music and Art Society next month (more details to come). Yep, not only will I sing out loud in public, I will stand up on a stage and sing for tons of people…who will have paid money to be there. Yep, this is completely insane. 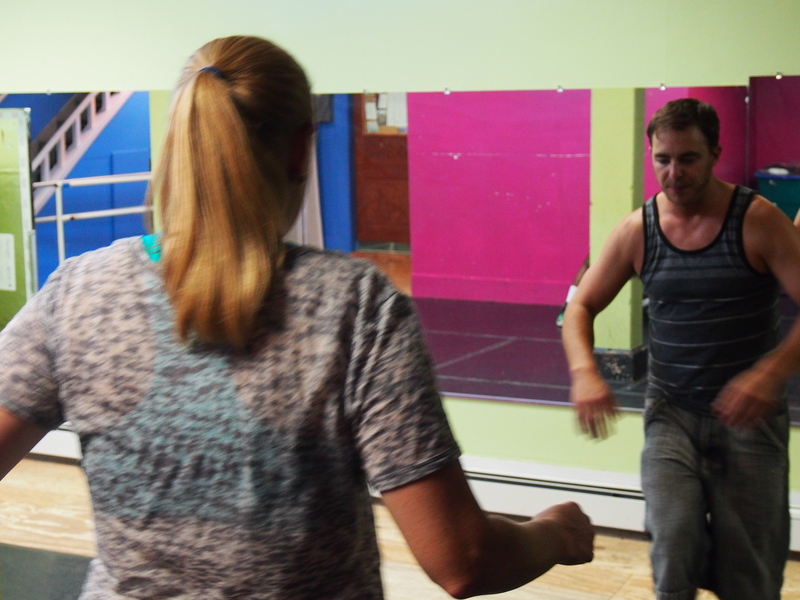 Additionally, vocal coach Christine Kasparian is donating her time and talent to whip my voice into performing shape. 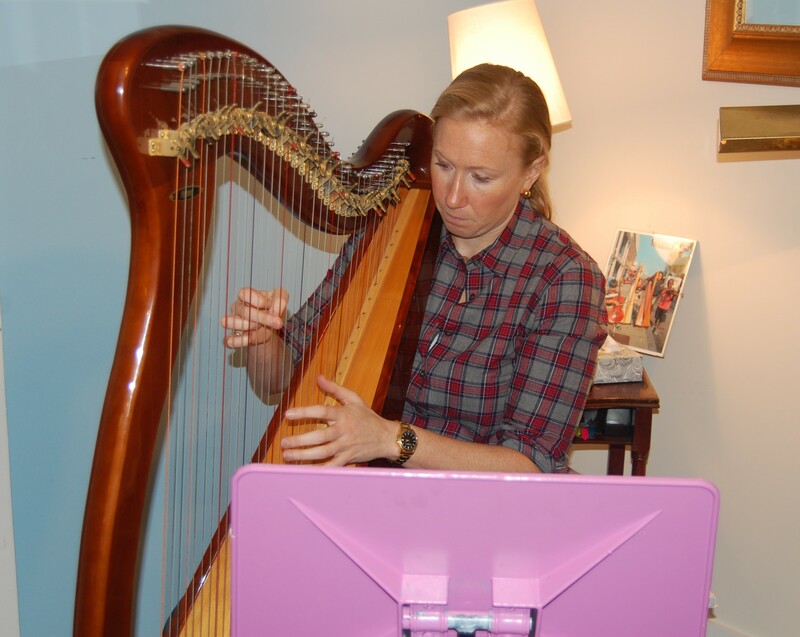 Christine runs a variety of musical programs and also offers voice lessons, mostly to kids. This seemed perfect because my singing ability is around a 10-year-old’s level. We had our first singing lesson this past Sunday, and even though I’m no longer that mortified freshman with braces, I was still really nervous. We started out by talking about breathing, and did some exercises to help me breath from the diaphragm and not from my chest. It was harder than I expected. We then started warming up my vocal chords by singing scales, which immediately produced flashbacks of the failed singing attempts of my youth. I was fidgety, and uncharacteristically shy when I was attempting to hit high notes. But I was reassured by the news that I was not in fact tone deaf. According to Christine and Chrissy, I could “find the note,” (i.e. I could sing the note they played on the keyboard) but my voice was “not developed.” I guess belting out Fleetwood Mac in my car has not been enough to develop those muscles. Let’s just say that I’m lucky I have a month to practice. What was so interesting about this experience is, despite the fact that I know I don’t sound very good, I don’t really care. I’m not as focused on the potential of embarrassing myself (or offending my audience’s eardrums) as I am focused on proving to myself that I can do this, despite my sordid history with singing. While this inner-reserve won’t prevent me from being laughed off the stage (although I really hope that doesn’t happen), at least I’m not preoccupied with that possibility at this point in my preparation. More details to come on the date of my performance…in case any of you want to witness this spectacle in person…and of course I will have a full re-cap post after my debut. Many thanks to Christine Kasparian and my dear friend Chrissy Lamont for helping me through this process. My self-confidence has been boosted by your support. I was not compensated in any way for this post. I love everything about throwing parties. 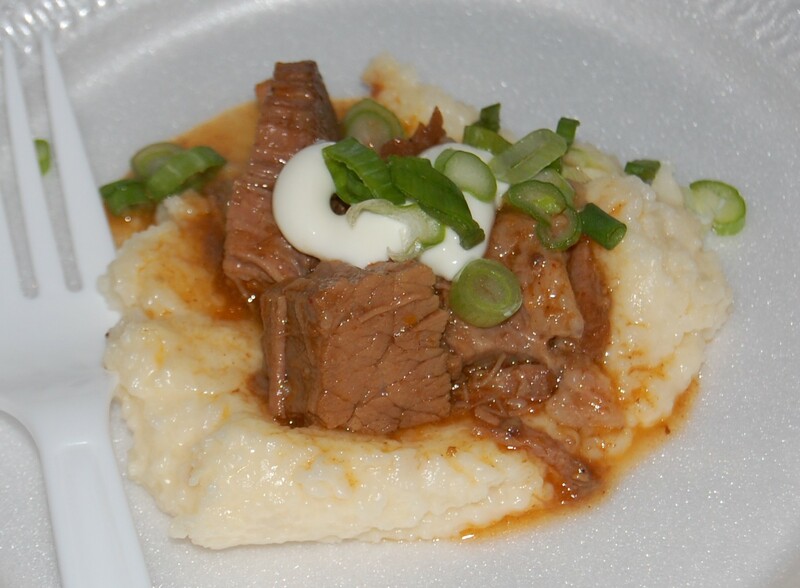 The planning, the cooking, the decorating…maybe not the cleanup, but I enjoy nearly every aspect of entertaining. I can’t wait until I’m all settled in to my new place so I can invite my friends over for a housewarming or “spring is finally here” soirée. I’m not so naive to assume that having a few dozen friends over to my apartment is the same as a large-scale corporate event, but seeing that I have an affinity for entertaining, I set out to learn how it should be done from some experts! Enter the incredible team from Corinthian Events. 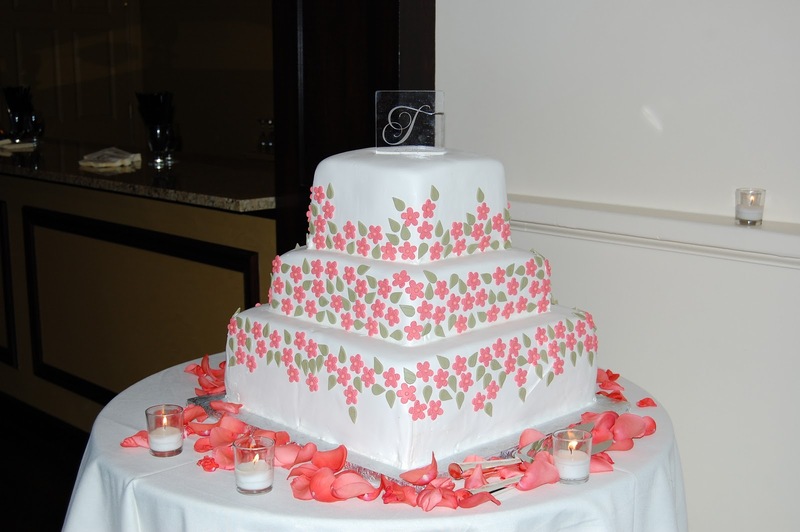 The Corinthian team has been planning spectacular corporate and non-profit events in Boston for the past 13 years. 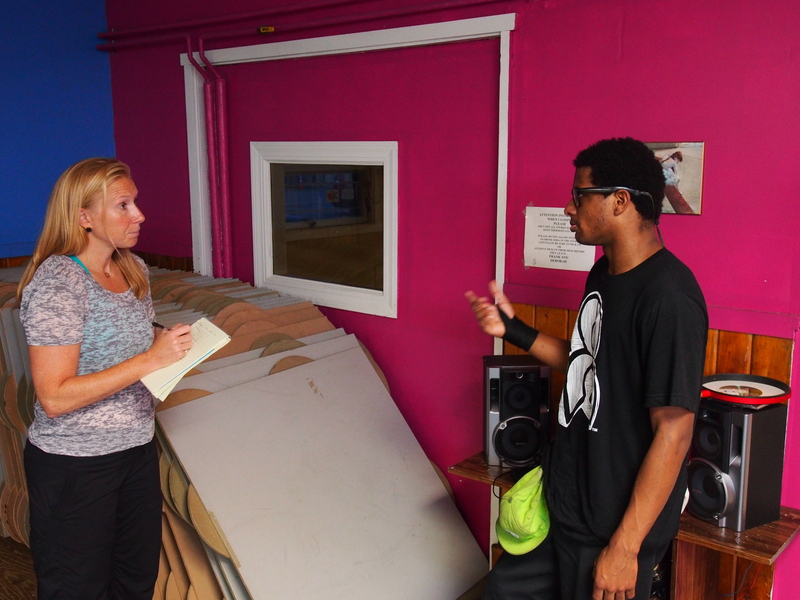 Corinthian allowed me to observe and help them with “Banned in Boston,” an annual event to benefit Urban Improv. “Its’ truly one of the most fun fundraisers in the city,” said Elizabeth Iannessa, the Corinthian team leader for this event. 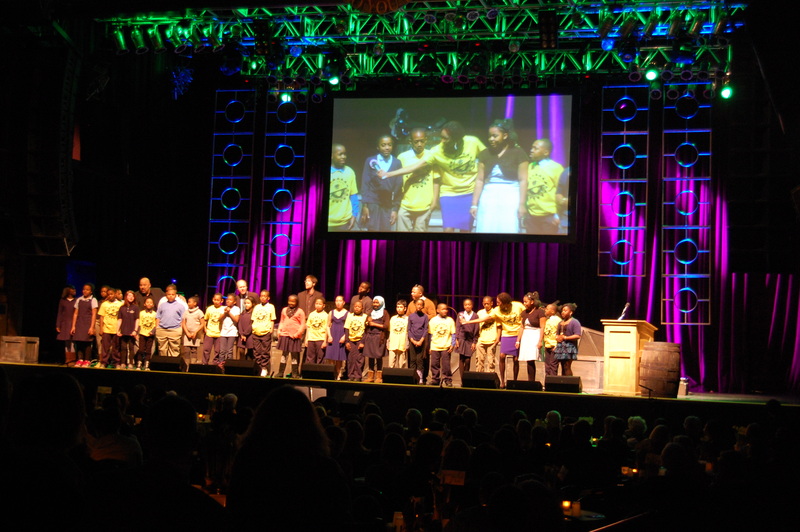 The non-profit Urban Improv uses improvisational theater workshops to teach young people violence prevention, conflict resolution, and good decision-making. Urban Improv’s actor/educators lead interactive workshops that offer Boston Public School students the opportunity to explore their own solutions to challenges though acting out real-life situations. Banned in Boston has two dynamic components. First, cocktails and dinner at the Lansdowne Pub which is nestled in the shadow of Fenway Park. 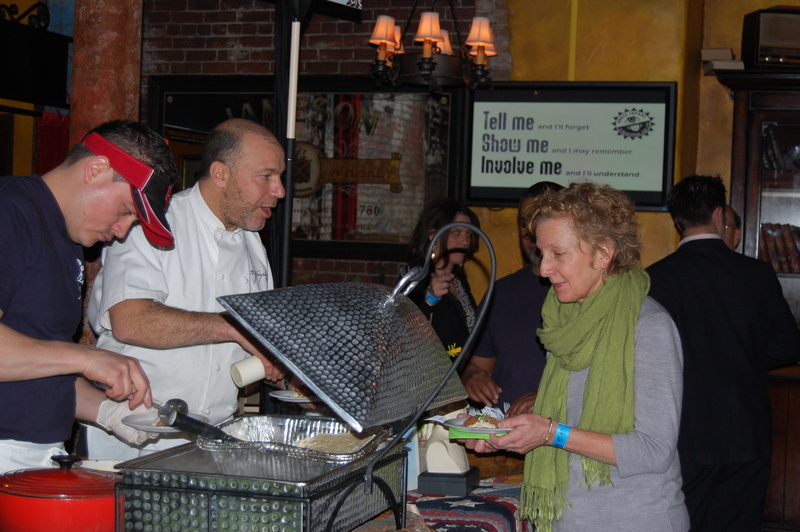 Some of Boston’s best chefs serve their favorite dishes to attendees. Later, guests make their way next door to the House of Blues for a glorified talent show featuring some of the city’s biggest personalities. Governor Deval Patrick sang, Emily Rooney acted out a skit modeled after “The Dating Game,” and City Councilman-at-Large Mike Ross was dressed up as Dennis Rodman. 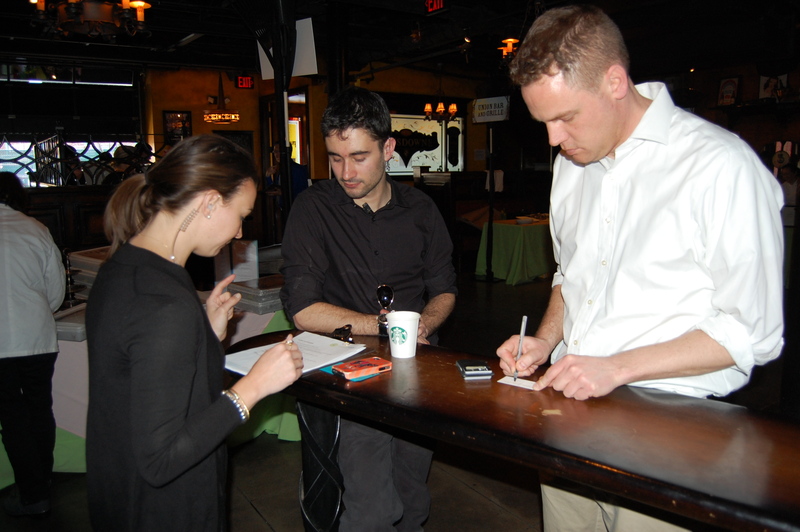 While I was only on-hand the night of the event, the planning of “Banned in Boston” began eight months prior. This was the sixth year that Corinthian has planned this event, so one of the earliest stages of planning involved developing and implementing new ideas to improve upon last year. While the look and feel of this, or any event, is important, the devil is truly in the details. 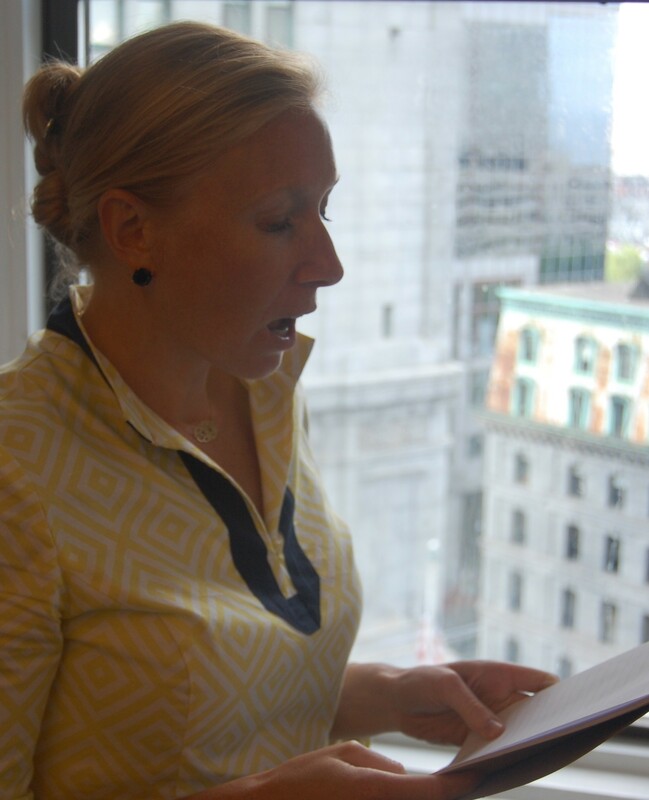 “We take the time to really wrap our heads around the logistics and the nitty-gritty details that are sometimes overlooked,” Elizabeth explained. The planning of the event starts on a macro level, and then goes micro; the so-called “run of show” schedules the event down to the minute. Members of the team have copies of the “run of show” and referred to it throughout the night. This micro-focus sets this experience apart from many of my past adventures. In this instance, being Type A is not a bad thing…in fact, it’s a job requirement. When I arrived at the Lansdowne Pub to help the Corinthian team set up I was delighted to see that they were all wearing earpieces. It was like a scene out of “The Wedding Planner.” Nothing says “I am a big deal” like an earpiece, and the event’s dual locations posed a Jennifer Lopez movie-worthy challenge. Elizabeth and her team had to make sure guests moved easily and seamlessly from one to the other at the appointed time. The kicker: they had to break-down the party and clean up before the Lansdowne Pub opened its doors to the public approximately 30 minutes later. That is where I would come in. Before the doors officially opened we were all given our marching orders. I was to roam around the event, making sure none of the trash cans got too full, and generally helping guests with anything they may need. While it’s clear that planning a party is not the same as attending a party, I can’t imagine a better work environment! 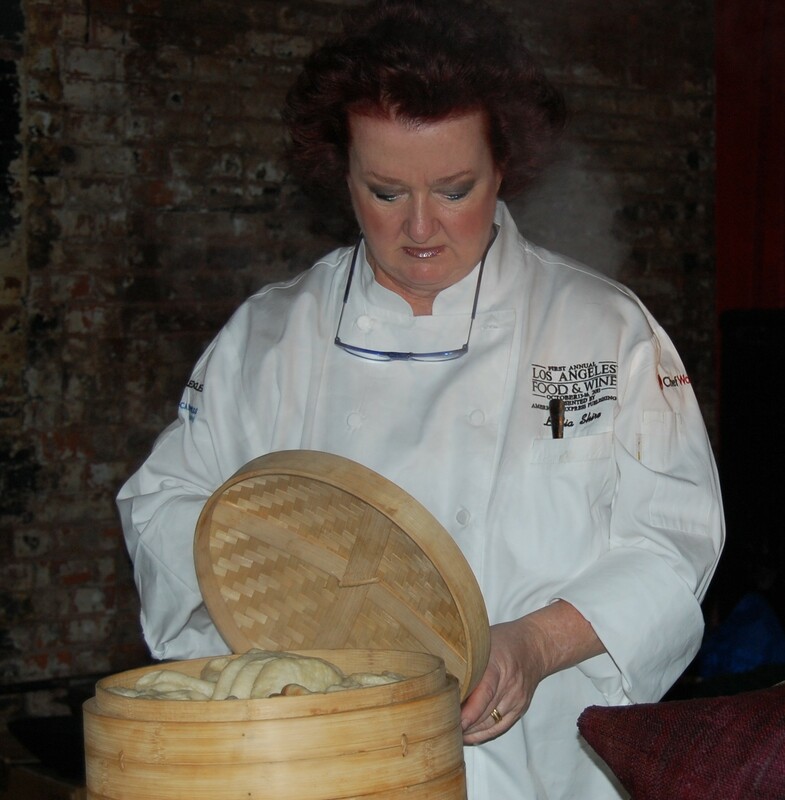 Everyone is having a great time and Boston’s top chefs like Lydia Shire dished out their favorite recipes. The eight-person Corinthian team (your’s truly included) was in constant communication, face to face and over their nifty earpieces and microphones; adjusting elements of their plan as needed. Another member of the Corinthian team, Laura Keeler, told me they plan everything they possibly can and then roll with the punched during the event, because you really don’t know what will happen. 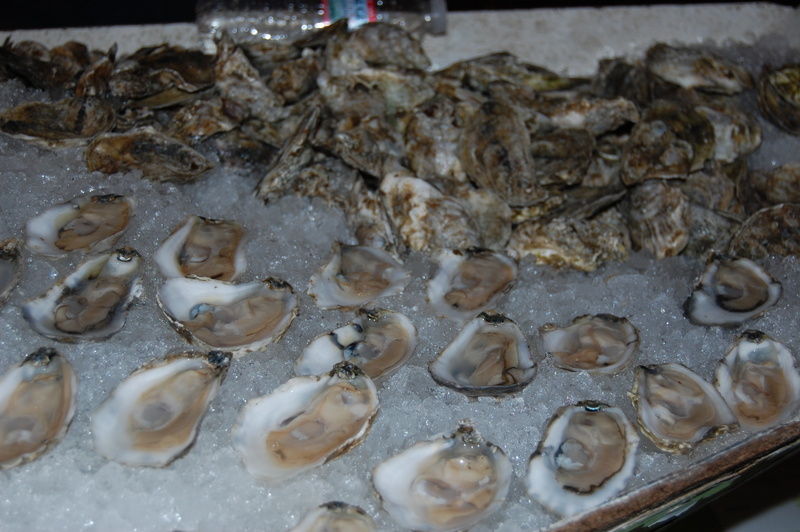 After nearly two hours of mingling and merriment (during which I may have snuck an Island Creek Oyster to two) it was announced that the main event, the show at the House of Blues, was about to begin. As is common with any great party, guests just didn’t want to leave. We had to politely and gently herd guest towards the door. Once the guests were finally finding their seats next door I really sprang into action, feverishly helping the chefs and their staff break down their tables and stations, clean up their equipment, and get the Lansdowne Pub ready for their regular Friday night clientele. It felt like a race against the clock, but the entire team divided and conquered the tasks and got the space ready in time. I figured this adventure would be fun and I would get some tips on my own entertaining, but what surprised me was that for the last year I had been trying to slough-off all my Type A nature, but with this experience I saw how control freak tendencies can actually be an asset. Elizabeth, Laura and the rest of the team had to pay attention to, and obsess over, every tiny detail in order for the event to be the success that it was. Maybe I need to stop looking at things – and myself – in black and white…laid back or ramrod straight. Maybe all the shades of grey create a tapestry of skills and experiences that help us handle a myriad of situations. Maybe I should be less focused on my Type A rehabilitation and just be more open to whatever comes my way. With my hard work over, I made my way to the House of Blues to enjoy the show, something that the real Corinthian team was not able to do. They were still in position, making sure the event went off without a hitch. The show was hysterical, I laughed out loud, and learned that Governor Patrick has a pretty good singing voice. I was able enjoy it a little bit more than I think I would have had I not been a witness to all the hard work and attention to detail that went into this fantastic night. Many thanks to Elizabeth, Laura, Courtney, Ben, Chris and the entire Corinthian team for letting me observe and help them execute a great event for a fantastic cause. I was not compensated in any way for this post. That’s right, while it’s difficult to admit out loud (let alone on this blog), and despite being a writer at heart in addition to a consumer of actual literature, I have also devoured all the Twilight books. I admit that the writing isn’t of the highest quality; but when asked, I cite the “powerful narrative,” of Stephenie Meyer’s series as the reason for my passion, while trying to retain my high-brow authority. In the past, when I have not been able to find a companion to see one of the movies, I have gone to the theater by myself. Sitting in the darkness I am filled with self-loathing, yet completely content at the same time. When I was graciously offered a ticket to an advance screening of the last installment of the movie franchise, inside I jumped for joy while attempting to stay cool and indifferent on the outside. To leverage this experience; and make it slightly less shameful, I am using this opportunity to see if being a movie critic could be my next career. I am a writer after all, I do love movies and I did learn from a famed movie critic, so I figure this could indeed be my next passion. To help in this endeavor, I spoke with John Black, who reviews movies for Boston Event Guide. He provided some sage advice, particularly for my situation, “It’s not about you, it’s about the movie.” I would have to leave my fandom at the door and be objective about what I was seeing. While I did bring a notebook with me to the theater, he suggested that taking notes wasn’t the only way to go. He suggested letting the movie sink in. Devoted fans of the “Twilight” franchise will never be disappointed in any of the film adaptations of the wildly popular book series, and the last installment will likely be no different. 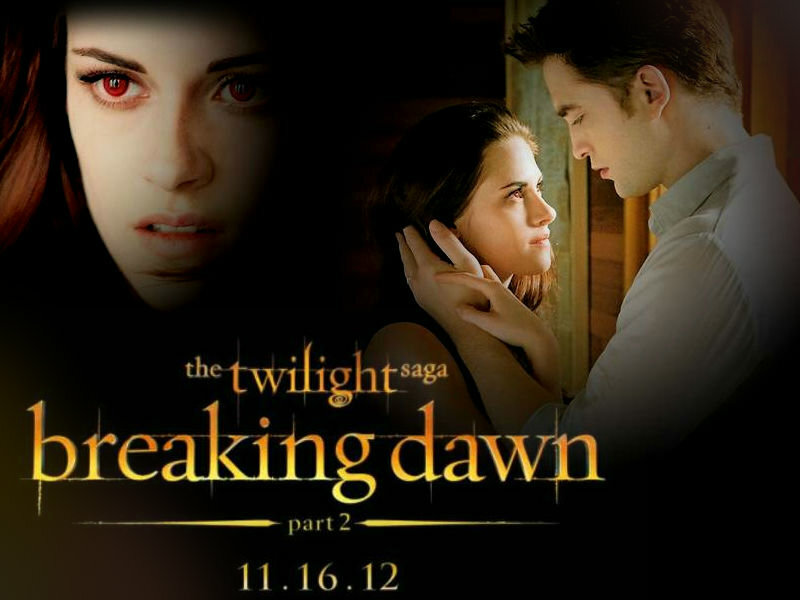 But for those movie-goers who have not read the books, they too may enjoy “Breaking Dawn Part 2,” because it strays from the book’s storyline in an unexpected and thrilling way. The movie picks up with Bella, played by Kristen Stewart, in what may be her most impressive performance to date. As the clumsy, awkward Bella Swan is transformed into an elegant and agile vampire, Stewart rises to the occasion and leaves her own awkward screen persona at home. In a majority of Stewart’s roles she has seemingly played her angst-ridden self. In this film she is more confident than audiences have ever seen her. The love story between Bella and Edward, played by Stewart’s real-life main squeeze (as of this writing), Robert Pattinson (who unlike Stewart, doesn’t seemed to have grown his Edward since the first Twilight film release nearly five years ago), picks up with Bella waking from the transformative coma we left her in at the end of the last film. 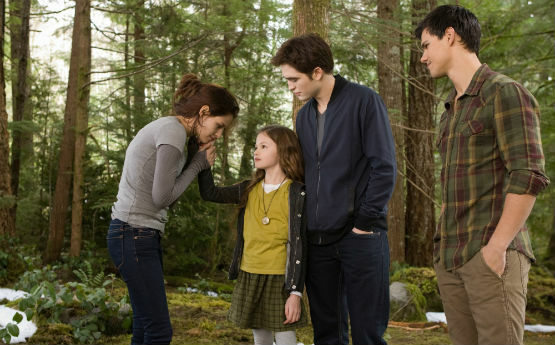 Bella is not only adjusting to life as a vampire, but also to life as a mother to her half-human, half-vampire daughter, Renesmee. Director Bill Condon was given a tall order: the book dictates that the child is beautiful even as a toddler. Although Renesmee, played by newcomer Mackenzie Foy, does have an elegance about her rare for a nine-year-old, the SGI used to put her likeness on the face of an infant isn’t effective. Baby Renesmee shares a likeness with those scary E-Trade Babies. Just as the Cullen clan settles in with their new member, who as it happens was imprinted upon by the hunky werewolf who once vied for her mother’s affections (a dynamic which when brought to life with actors seems even more creepy than when read), danger finds them…again. The powerful equivalent of corrupt vampire law enforcement — the Volturi — learn of Renesmee’s existence, but mistakenly think she’ s a dangerous “immortal child,” instead if the 50/50 split that she actually is. This sets off a chain of events that diverge from Stephanie Meyer’s book, which if you have been living under a rock are what the movie franchise is based upon. The plot change comes in two electrifying doses, both of which will leave fans of the books, and newbies to the series, gasping with surprise. Condon takes a chance and it pays-off, elevating the film — which up until that point seemed to be going through the motions set in place by its predecessors — to a new level. As with the films that came before it, “Breaking Dawn Part 2” has an air of self-parody; at times you don’t know if you are laughing with the movie, or at it. But in this last hoorah for “Twilight,” it seems to accept and revel in its cheesiness, saved by its surprising and dynamic twists and turns, until it delivers you to a happy ending audiences would be outraged without. This is the best “Twilight” film yet. That may not be saying all that much, but it will certainly satisfy and surprise long-time fans, as well as those who got roped in to going along with them. I would like to thank Rachel Pope and Jen Mathews for helping to make this all possible. Thanks also go out to John Black for his guidance. I was not compensated in any way for this post. Those who know me know that I cry at weddings. And not a delicate tear slowly rolling down my perfectly blushed cheek the way people cry in movies. No, my nuptials waterworks are more of the whimpering, blubbering variety. And at Raquel and Tyreak’s wedding I realized that I don’t even need to have a personal relationship with the bride and groom to induce my wedding weeping. 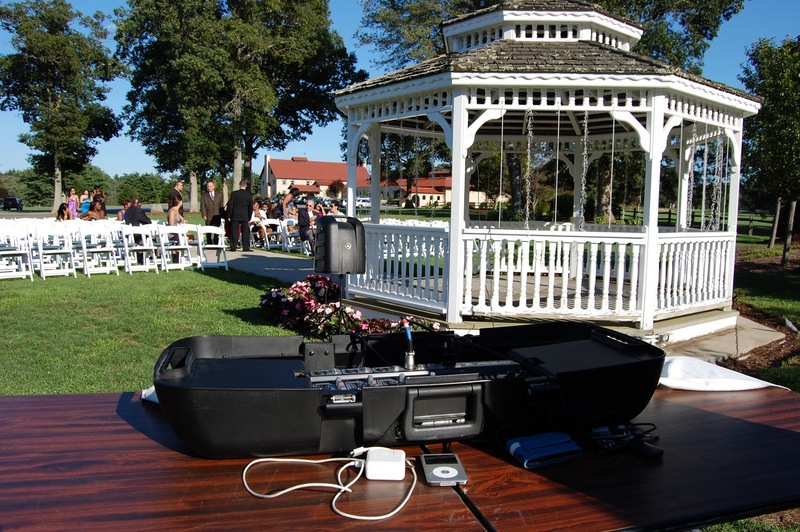 I realized that this innate part of my nature makes the chances of me being a good wedding DJ pretty slim. 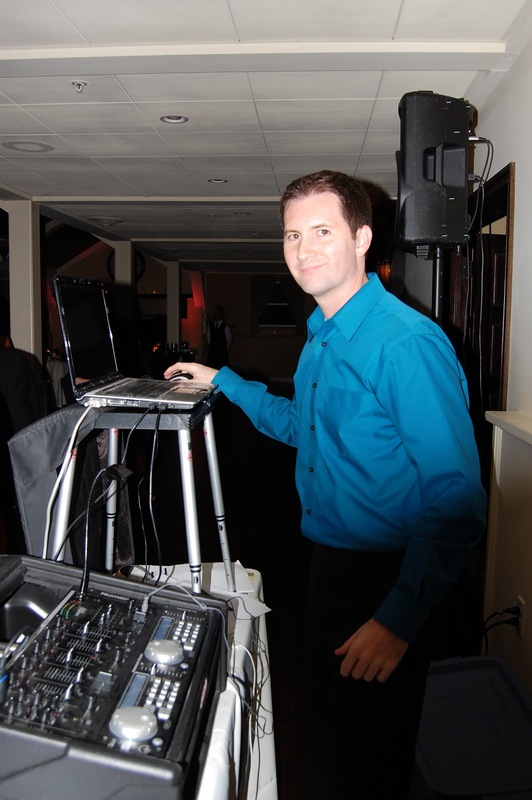 DJ Tommy was kind enough to let me help him as he spun the tunes for the happy couple’s ceremony and reception. I had imagined us scratching old vynls as wedding guests chanted “Hey Miss DJ.” Ok, that did not happen. These days the world of DJ’ing is a digital one. We were armed with a laptop instead of boxed of records. But don’t think that the ability to create a play list made this experience an easy one. There was a curve ball: the bride and groom are Cape Verdean (Cape Verde is an archipelago off the coast of West Africa) and wanted to include some traditional tunes. We had to work very unique Cape Verdean songs — with their thumping beats and perfectly complementary melodies — in with Justin Bieber and Jay-Z? We did manage to master the mix, but this was not a dancing bunch. 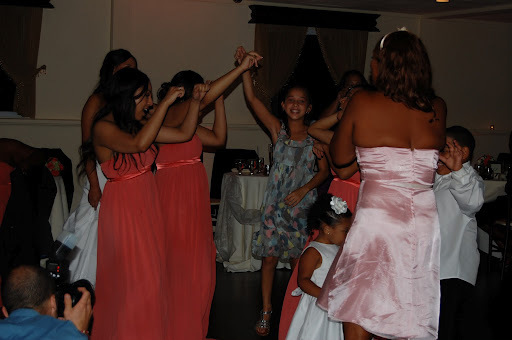 When I am a guest at a wedding, you can’t drag me from the dance floor. But this group couldn’t be lured out there. There was more dancing going on behind the DJ booth than on the dance floor. 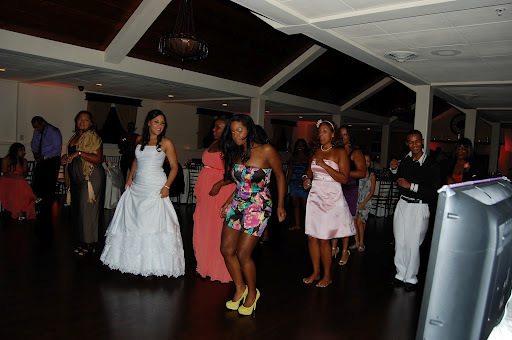 We played all the requests we received including a few new(to me) dances I had never heard of including the Cha Cha Slide and the Cupid Shuffle (watch these videos to learn the steps) which are the modern day versions of the Electric Slide — where have I been? Those did get a good number of people out on to the dance floor, but it was a fleeting moment. These people just didn’t want to dance. DJ Tommy has the experience to know that every crowd is different, and as long as the bride is happy the night should be considered a success (and at the end of the reception the bride did gushed about what a good job we did) but it was hard for me not to view the night as a failure. I had envisioned my DJ debut as looking more like late-night at the hottest club, not a middle school dance with only a brave few cutting a rug. But I had to remind myself that this night was not about me and my potential future as a DJ. It was about Raquel and Tyreak, and the first night of their life together, and if the night is measured by the smiles on their faces than it was a huge success! DJ Tommy and I had every foot in that place tapping, every head bobbing…even if we couldn’t get their entire bodies into it. So, tears and all, it was a pretty good night for DJ E-M. Many thanks to DJ Tommy who was so great to let a DJ wanna-be hang out with him. And to Raquel and Tyreak for letting me share their special day with them.